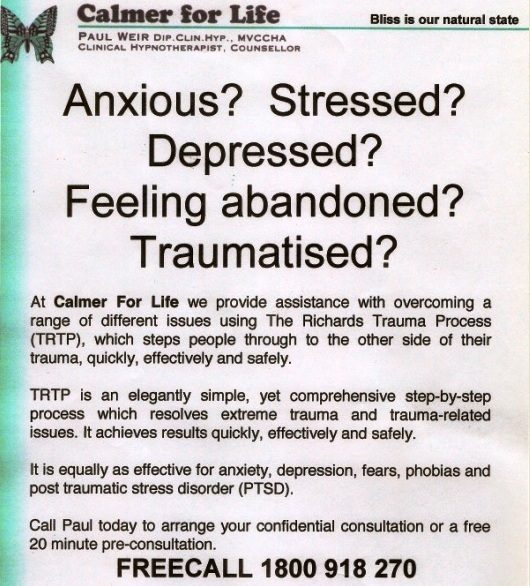 At Calmer For Life we provide assistance with overcoming a range of different issues using The Richards Trauma Process (TRTP), which steps people through to the other side of their trauma, quickly, effectively and safely. TRTP is an elegantly simple, yet comprehensive step-by-step process which resolves extreme trauma and trauma-related issues. It achieves results quickly, effectively and safely, generally in three sessions. It is equally as effective for anxiety, depression, fears, phobias and post traumatic stress disorder (PTSD). “The Richards Trauma Process gives people a clean slate and puts the past in the past once and for all” – Dr. Martha Landman. “The Richards Trauma Process brings a significantly different approach to trauma. It has been created in the time-honoured method of real life experience. Over 100 mental health practitioners across Australia trained in TRTP are achieving the same significant outcomes. The claims are genuine”. – Judith Richards. Both the mind, and the body, need to know that disturbing experience is over, you are safe now, and you are returned to calm – for life. Bliss is our natural state. If this speaks to you, or perhaps is for someone you know and care about, make a free call to Paul now on 1800 918 270 to arrange a free 20 minute pre-consultation.